Until the 2015 spring semester, senior Kolby Kickingwoman hadn’t written a lot of long form in his time at the School of Journalism. He’d focused on shorter stories, most of them about sports. Six months later his first long form story tied for 17th place in the Feature Writing Competition of the prestigious Hearst Journalism Awards. 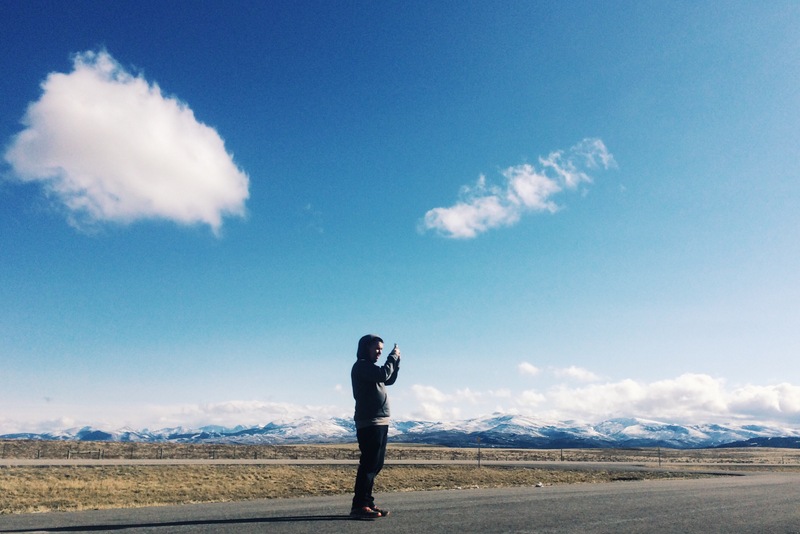 Kolby Kickingwoman stops to capture the view on the Blackfeet Indian Reservation, where he was reporting a story that placed 17th in the Hearst Journalism Awards. Photo by Celia Talbot Tobin. The Hearst Awards are the most prestigious awards directed specifically towards journalism students. The story Kickingwoman wrote was for the Spring 2015 Native News project, a class that sends teams of journalism students – a writer paired with a photographer – out to each of Montana’s indian reservations. Reporting from the Blackfeet Indian Reservation, Kickingwoman and his partner, photographer Celia Talbot Tobin, told the stories of tribe members navigating questions of sexual and gender identity. One storyline followed a transgender teen attending her first prom, another a gay man in his twenties. “I had a lot of fun doing that story,” Kickingwoman said. He is pleased to have won an award for a piece where he found both the subject matter and the length of the writing to be a challenge. “It was kind of outside my comfort zone,” he said. The story came together quickly. Kickingwoman and Tobin found their teenage subject while already in Browning, a city on the reservation. While spending time with another subject, they learned via Facebook of the transgender teen whose story would play such a big role in their final piece. Tobin thinks Kickingwoman’s personality helped them get the access and intimacy that allows for good feature stories. She described Kickingwoman as easy going and sensitive to her needs as a photographer. “He’s a really good people person, which came in handy a lot as I was trying to be invisible and photograph and film people. He is really, really good at being engaging with subjects, being interested in them,” Tobin said. As a graduate student with a history of freelance photography, Tobin has more experience than most students, and enjoyed watching someone with a background in shorter pieces weave a compelling narrative of this length. “I think it’s a strong story and a really unique one that hasn’t been told before. He pushed himself a lot I think, outside his comfort zone,” Tobin said. Kickingwoman grew up in Missoula, but his father is from Browning. It was rewarding to place in the Hearst awards, he said, and “to represent the Blackfeet nation and win an award about a story from Browning. You can read Kickingwoman’s story, view Tobin’s photos and learn more about the Native News project here.